People who love plants understand there is a natural rhythm to life. A rose bush, a maple tree each has a cycle. Every spring, when the winter fades and the natural world begins to awaken, a rose bush will not only leaf with its exiting branches – but put out new shoots, as well. The tips of the maple limbs will stretch and grow, adding a few inches to its height and width. This is the natural cycle of creation. As humans, even though we are surrounded by the reality of nature, we forget that we are also part of that cycle. It isn’t that we age every year, getting older and closer to death. Like the maple and the rose, our natural psyche expands with each turn of the earth around the sun. We perceive something we hadn’t seen before, explore new horizons in work or family life, develop new insights, decide to start a new hobby or continue to hone and develop our skills with an existing interest. This expansive impulse is natural for everything in creation – especially human beings. And like a rose bush or a maple tree, the cycle of expansion doesn’t end until the moment of our death. Abundance is unavoidable because expansion is unavoidable. As long as you live and breathe, you are continually expanding. The question is – where is your abundance? Are you abundant in misery? In doubt? In unhappiness? In questions and insecurity? Or are you abundant in optimism? In faith? In happiness? In taking life as it comes? Where has your abundance taken root? Expansion is inevitable. The key is to know which way you want to expand yourself, and to be in command of your energy enough to deliberately expand in positive ways. None of us can ever get rid of our shadow side completely. But you can identify and cultivate what is beautiful in you; what is most effective in your habits; what your strengths are; what the unique gifts are that you have to offer. Then with a meditative mind, deliberately move your energy so that the beauty in your life grows and grows. It’s a matter of where you put your attention. Sometimes we get to a point in life where we feel stuck or where the world around us falls apart. It can feel frightening. With the change of Ages, that experience will become more and more prevalent for people. But if we anchor to the principle that expansion is a continual process, then when things fall apart, we can understand it’s because expansion is no longer possible in the current form. As safe as it may feel, as familiar and comfortable – our soul and psyche have nowhere to go. No space to grow. And so a pressure gets created between the environment and the life energy until we have to try something different, and open up to new possibilities for the power of expansion to flow freely. As we get closer to Summer Solstice 2011, the last Summer Solstice of the Piscean Age, I invite you to meditate on ways you want to expand into the Age of Aquarius. Identify the best in you, the most beautiful aspects of your life – and use the powerful expansive energy of the sun at Solstice time to propel yourself into a positive and prosperous future. 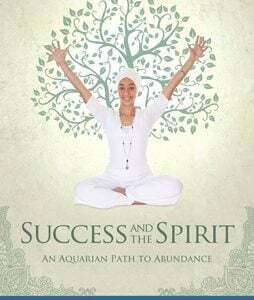 Success and the Spirit: An Aquarian Path to Abundance contains the wisdom and teachings of Kundalini yoga and Sikh Dharma as taught by Yogi Bhajan and was edited by Ek Ong Kaar Kaur Khalsa. Visit KRI to place an order. 112044989975134760 - Narayan with Auntie Adarsh Kaur.